Sophia Rosa Berghout was born in Rotterdam in 1909 into a musical family. Her father, Johannes Cornelis Berghout, was an all-round musician, who taught, directed choirs and chamber orchestras, and wrote church music. Phia began her musical studies with her father at the age of five on the piano and when she was six on the violin. She took up the harp at the age of fifteen, with Rosa Spier. After a difficult choice between Chemistry and Harp, she entered the Amsterdam Conservatoire where she received degrees in orchestral as well as solo playing. Phia thoroughly enjoyed this study period, but it was also a time of financial need and she earned her living by playing with the Fritz Hirsch Operette, a musical comedy group. From 1933 to 1945 Phia was second harp of the Concertgebouw Orchestra in Amsterdam. During this time she was briefly married to Johannes den Hertog. In 1945 Phia followed in her teacher’s footsteps to become principal harp until 1960, and shortly after the Second World War she also took over Rosa Spier’s harp class at the Amsterdam Conservatoire. During an outstanding solo career Phia Berghout commissioned and – more often – inspired works from composers like Henk Badings, Hans Henkemans, Lex van Delden, Jurriaan Andriessen, Hendrik Andriessen, and Marius Flothuis. She had a long-standing duo with the Dutch flautist Hubert Barwahser and was a member of many ensembles. She recorded all the main works in the harp repertoire. From 1974 onwards she concentrated her teaching activities in the Maastricht Conservatoire with a growing number of international students. As a teacher she was both demanding and inspiring. She insisted on musicianship and intelligence in playing and she instilled in her pupils a great commitment to the instrument. Phia felt strongly that young musicians did not have enough opportunity to reflect upon their future career and broaden their experience of the arts. With this in mind she started the Eduard van Beinum Foundation in memory of the conductor with whom she had worked closely and whom she so much admired. 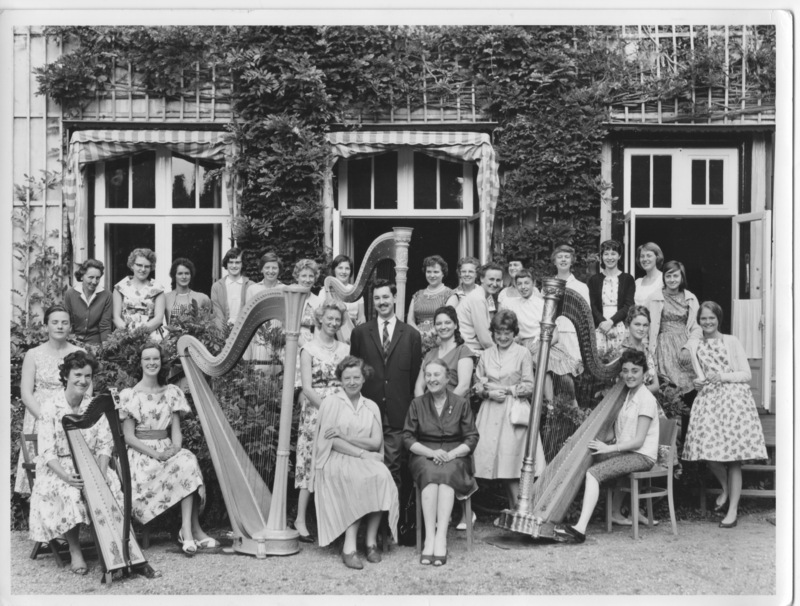 From 1960 onwards, Phia organized the International Harpweeks in Queekhoven, an old manor near Amsterdam. These were led jointly by Phia and Maria Korchinska. The Harpweeks brought together colleagues who hitherto had had no opportunity to meet harpists from other parts of the world. The number of participants grew steadily, reaching record levels of nearly 300 by the early Eighties. At this time an international board was formed to continue Phia’s work: the World Harp Congress. Maria Alexandrovna Korchinska was born in Moscow in 1895. It was her father who decided she should play the harp because he foresaw that she would have to earn a living. Her first teacher was Ksenia Erdeli and she continued her studies with Slepushkin at the Moscow Conservatoire. In 1911, at the age of 16, her final recital earned her the first Gold Medal ever awarded to a harpist. When Slepushkin died she succeeded him as professor at the Conservatoire, where Vera Dulova was a pupil in her class. She was appointed principal harp to the Bolshoi Theatre in 1918. The Great War was coming to an end and Russia had suffered Revolution as well. Maria Korchinska’s harp was her family’s lifeline. Her position entitled her to carry the White Card, giving her the same rations and privileges as a soldier in the Red Army. In 1922 she married Count Benckendorff, who had been an officer in the Russian Imperial Navy and was a keen amateur flautist, later playing under the name C.Kony. He had fallen foul of the Communist authorities and feared for his life. They succeeded in emigrating to England with their baby daughter, Nathalie, in 1924 when on a concert tour from which they never returned to Russia. Kony’s father was the last Tsarist Ambassador to Britain and already owned properties in England. The family, which soon included a son, Sasha, lived between homes in London and Suffolk. Maria had no intention of working hard at this time but the family ran short of money so she took to the road with her harp for solo and chamber performances. She gave many fine concerts with the Griller Quartet in the 1920s and ‘30s. She devoured new music as quickly as it was written and presented the British premieres of now standard works by such composers as Caplet and Roussel. During the Second World War she played all over the British Isles while her two children served in the Armed Forces. It was during the War, on 4 December 1943, that she premiered the final version of “A Ceremony of Carols” in London’s Wigmore Hall, with Britten himself conducting. After the War the Wigmore Ensemble was formed, a unique, flexible chamber group of the top artistes of the day. Their programmes nearly always included Maria Korchinska. They commissioned new pieces and had a special association with Arnold Bax, who wrote five chamber works with harp. An excellent sight-reader, Maria also played on film scores and light music recordings and she eventually took on some private pupils. She was a fierce and demanding teacher, insistent upon punctuality and good manners! In 1959 the Israel Harp Contest was founded, bringing together an international panel of judges for the first time and inspiring the formation of harp societies in many countries of the world. 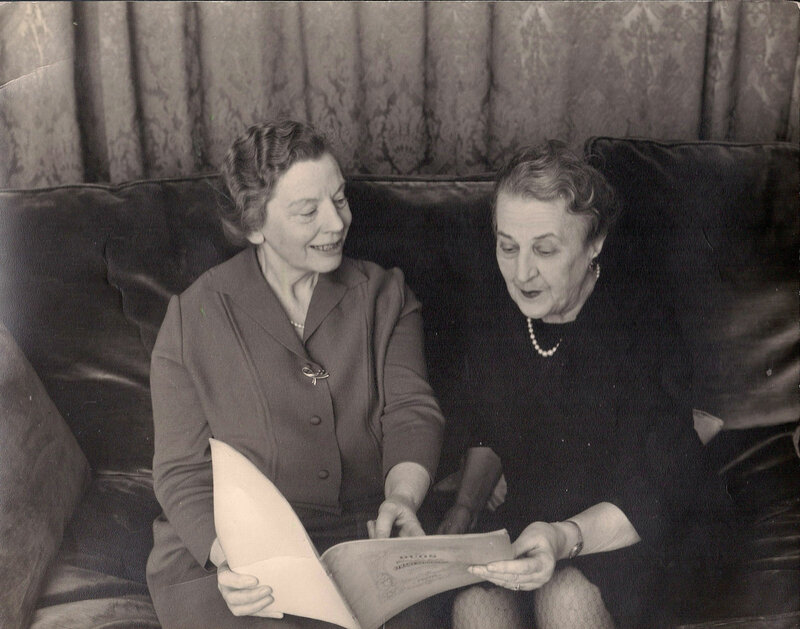 Maria Korchinska and Phia Berghout both served as jurors and thus began an extraordinary friendship and the dawn of the International Harpweeks held every summer in Holland. They were a sort of ‘double act’ … Phia calm and encouraging while Maria was outspoken and mischievous! Vera Dulova was granted permission to come from Moscow with her students, so Maria could proudly follow the development of the Russian School. The World Harp Congress grew out of those Harpweeks and we still feel the guiding spirit of their inspirational founders, Phia Berghout and Maria Korchinska.